A 12 y o male with recurrent partial complex seizures. 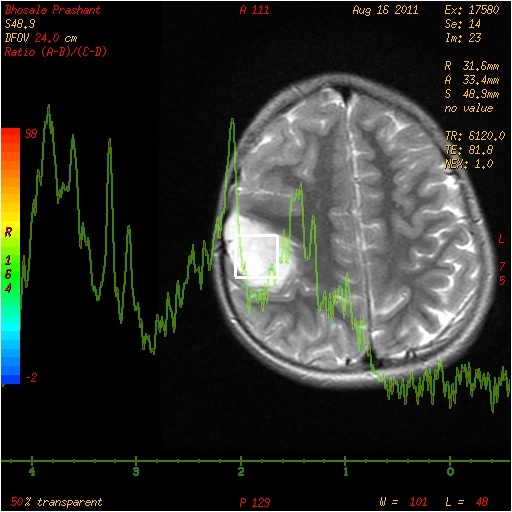 This MRI study of Brain shows an intra axial well circumscribed right parietal cortical lesion. Signals are low on T1, isointense to Csf on T2 , absence of complete signal suppression on Flair. Typical bubbly cystic appearance on T2w images. Lacks surrounding vasogenic odema. A thin hyperintense rim on FLAIR may suggest Gliosis. Non enhancing on post contrast T1, may see few faint enhancing nodules. No dense dystrophic calcification on T2 *GRE or any hemosiderin staining. No restricted diffusion on Dw images. No mass effect or volume loss. Mild scalloping of inner table of adjacent bony calvarium. 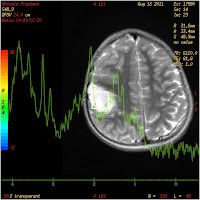 MRI spectroscopy non specific. Lactate peaks at 0.9 to 1.3ppm. 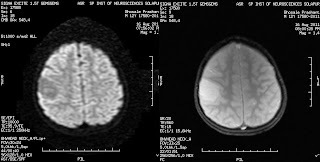 Imaging diagnosis : Findings are very typical of DNET. 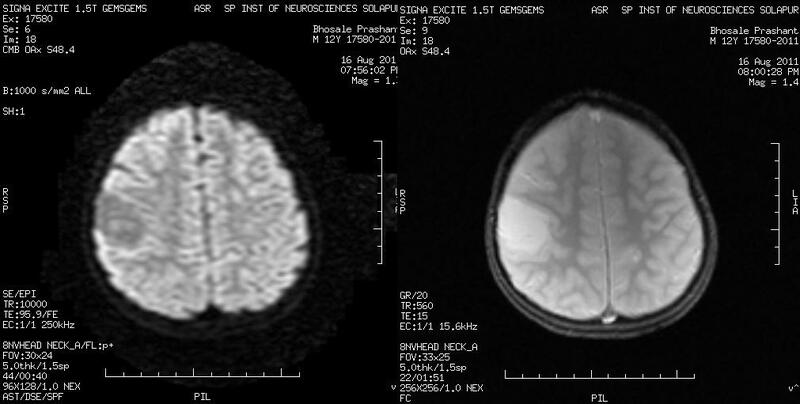 A benign, focal, intra cortical mass superimposed on background of cortical dysplasia. Imaging wise diagnostic clue is a well-demarcated, wedge-shaped "bubbly" intra cortical mass in young patient with longstanding partial seizures. Temporo parietal lobe is common location. Lesion is hypo dense and non enhancing on CT.
Cystic T2 hyper intensity on MRI, incomplete signal suppression on FLAIR. Non enhancing on post contrast, may show faint focal, punctate or ring-enhancement in 20%. No restricted diffusion on Dw images. T2* GRE images are non contributory but may show hemosiderin staining owing to bleed which is very uncommon in DNET. Minimal or no mass effect is typical. Very slow growth over many years on follow up imaging. MR Spectroscopy findings are nonspecific, but lactate present in some. 18F-FDG PET demonstrates glucose hypometabolism. Lower [Ue] methionine (MET) uptake in DNET than in ganglioglioma or gliomas. DNET contributes to < 1% of all primary brain tumors. Genetics : Sporadic > Nonneoplastic focal cortical dysplasias may be syndrome related. Gross Pathologic & Surgical Features are neocortical lesion, thick gyrus. Microscopic Features are "specific glioneuronal element" (SGNE), columns of heterogeneous cells oriented perpendicular to cortex. Oligodendrocyte-like cells arranged around capillaries. Other cells show astrocytic, neuronal differentiation. Most common clinical presentation is longstanding Epilepsy, difficult to control partial complex seizures, common in child or young adult. Non gender preponderance. In natural History & Prognosis, these are benign lesions. No to very slow increase in size over time. Seizures may become intractable. Glutamate receptors shown within tumor and margins may explain typical difficult to control seizures. Surgical resection of epileptogenic foci.